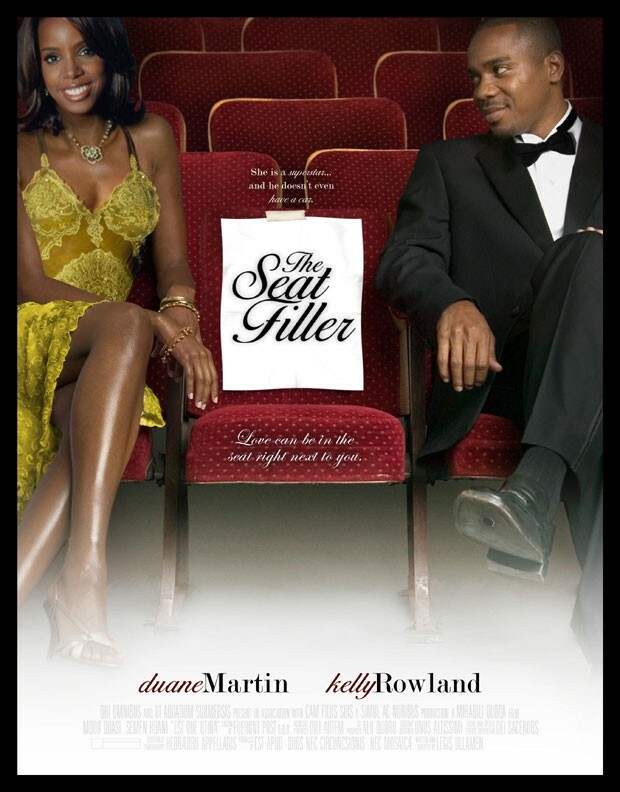 Now in the case of THE SEAT FILLER you would most likely take it as a given that we watched it because it’s a romantic comedy with a predominately black cast. And in this case, you’d be wrong. ‘Cause if you’ve been hanging around me for any length of time you know that romantic comedies are on the bottom of my list when it comes to movie preferences and I don’t much care who’s in it. But Patricia was intrigued by the title and asked me what a seat filler was. After I explained the job of a seat filler, she wanted to see it. And just in case anybody out there doesn’t know what a seat filler is, attend: seat fillers are hired to occupy empty seats vacated by celebrities at major award shows. The purpose is to give the folks watching the event at home the impression that the audience is full. I figured that any movie that provides me with the opportunity to ogle Kelly Rowland for 90 minutes with the permission of the wife can’t be all bad so I settled in. And you know what? At the end of those 90 minutes I had a pleased smile on my face as I ended up liking the movie a lot more than I thought I would. Derrick Harver (Duane Martin) is a young, good-looking guy determined to make his dream of becoming a lawyer come true. To pick up some extra money in order to continue his studies and help out his family, he takes a job as a seat filler along with his best friend/roommate E.J. (DeRay Davis). It’s a steady gig since he lives in Hollywood and the movie’s main running gag is that there’s always some award show going on. The number one rule of seat filling is to Never Talk To Celebrities. But Derrick can’t help himself when the gorgeous up-and-coming pop singer Jhnelle (Kelly Rowland) is seated next to him. They hit it off almost immediately and Jhnelle quite naturally assumes the tuxedoed, well-mannered, funny and charming Derrick is also a celebrity as well. She has him checked out and in one of those cases of mistaken identity that is the pumping heart of so many romantic comedies, Jhnelle thinks he’s Alonzo Grant, hotshot entertainment lawyer. However, the sheer chemistry and likeability of the cast was enough for me to overlook that and just enjoy the movie. I’ve always been a huge fan of Kelly Rowland and it’s an injustice she doesn’t have a bigger career as she’s far more talented and beautiful than most of the One Name Wonders pretending to be singers. Along with Duane Martin they work at selling the story and the characters and it worked for me. In supporting roles as the obligatory best friends of the lead actors, DeRay Davis and Melanie Brown (yep, Scary Spice herself) know what their role is in a movie of this type and act accordingly. Although DeRay Davis does get a little out of control every once in a while, it’s not annoying and thankfully the movie doesn’t hold up the story for his hijinks. Shemar Moore, Patrick Fischler and in a sneeze-and-you’ll-miss-him role Glynn Turman provide stable, solid support. So should you see THE SEAT FILLER? Why not? It’s a nice little movie you and your significant other can snuggle up with and enjoy without guilt. The contrivances of the plot get bent a little out of shape to drag out the mistaken identity bit but the movie has good intentions and that goes a long way with me. And it’s always an added plus when I can find a movie with an African-American cast that doesn’t insult me with stereotypical ignorance.